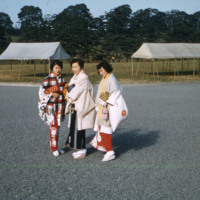 Three Japanese women stand in a wide gravel road. 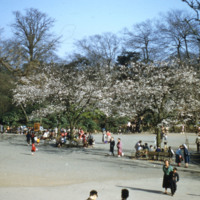 Groups of people outside in a park standing by the many trees in the open space. 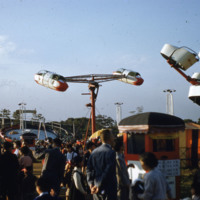 People attending a carnival walk near a number of rides. A farmer and a small, heavily laden night soil truck in a cultivated field. Night soil trucks are more commonly known as Honey-Bucket trucks. 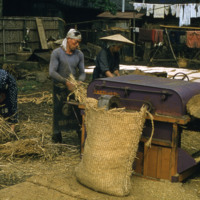 Three people work around a hay baling machine. 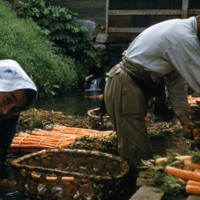 A man and woman bundle a large number of carrots into groups. 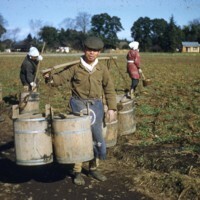 Only 20% of Japan's land is suitable for cultivation, and the agricultural economy is highly subsidized. 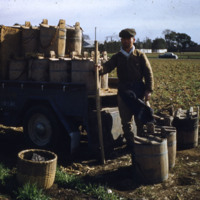 A farm worker carrying several large buckets of night soil stands in front of a field. Construction workers, farmers, rickshaw-pullers, and others often wear a type of tabi called jika-tabi. 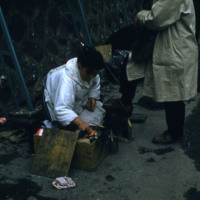 A woman and child cook lunch with a pot on top of a stone oven. 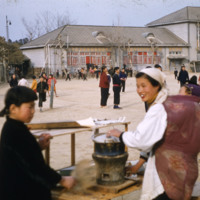 In the background, children at recess play in a large schoolyard. After World War II, US soldiers found their dull boots to be a disadvantage when trying to impress local women. 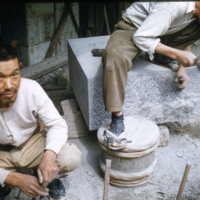 Masons dress a large block of stone. 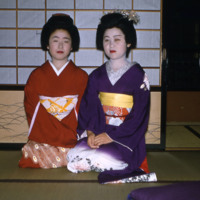 A maiko is an apprentice geiko (not quite the same as geisha) in Kyoto. 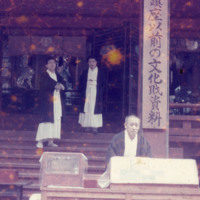 Their jobs consist of performing songs, dances, and playing the shamisen or the koto for visitors during feasts. 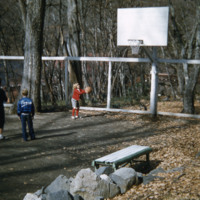 Children play basketball with a background of trees and a footbridge. 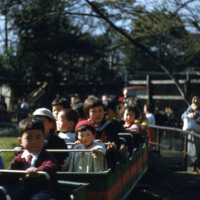 Several cars of an amusement park ride filled with an array of children. 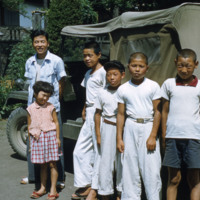 A group of young Japanese men and children, stand near a military Jeep. A row of children in sports uniforms. One holds a trophy. 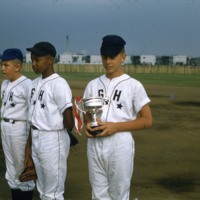 This is a Little League team, specifically the Grant Heights team which Charles Nicholas Johnson's son played on. 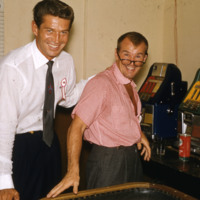 Actors George Nader and Burgess Meredith smile for the camera near a counter with two slot machines on it. 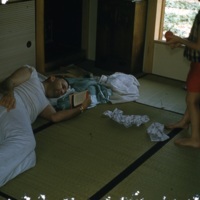 A man lying on tatami reading a book. Tatami was originally considered a luxury item for the nobility throughout much of its early history. 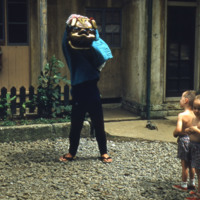 A demon mask worn for the Setsubun, which is celebrated February 3, the day before the start of spring in the lunar calendar. 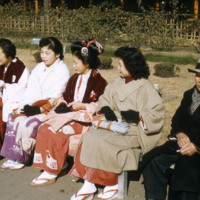 A row of four seated Japanese women wearing brightly colored clothing with zori on their feet.